surfing images : 1788 to 1870. "A View of KaraKakooa, in Owyhee." First image of surf board. 1778. 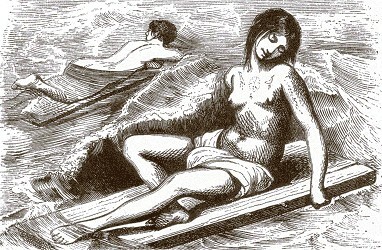 Weber : First image of an surf board. John Webber (Artist) Engaving by W. Byrne : "A View of KaraKakooa, in Owyhee." An engraving based on an original drawing by expedition artist, John Webber, of Captain James Cook's arrival at Kealakekua Bay, Hawaii 17 January 1778. Printed in the official account of the voyage, Plate 68. See Lt. King : 1789. Full version with highlighted section, below. Margan and Finney (1971) Pages 20 - 21. Kampion (1997) Page 32. Nat's History (1983) Page 33. DelaVega (ed, 2004) Page 15. Cropped version from Kampion (1997) Page 32. Featured area added. The identification of the illustration, Madrassan men surfing, by Charles Gold by the curators of the ANMM is a significant contribution to the history of surfing. Known to be based on his personal observation and dated 1800, it is currently the earliest known image of wave riding; similar images from Hawai'i were not published until the 1830s, see below. To the left, it shows one man riding a three-log catamaran shore ward on a considerable wave. 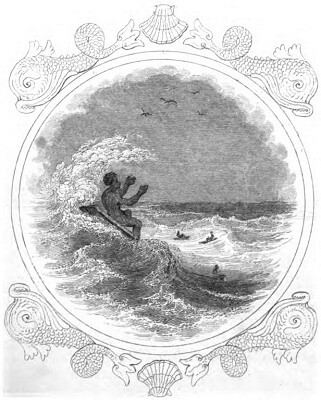 He rides upright, with his feet parallel, and holding a paddle, while at the illustration's centre, two men are seen on a similar craft in the second line of breakers. A masula, also known as masoola or masulah, a local surf boat with a crew of six, is heading through the outside breakers, transporting freight for the ships of the East India Company, awaiting off-shore at the Madras Roads. At the turn of the 20th century, the catamaran surfing technique was replicated with the development of stand-up paddleboards (SUPs). 1800 Charles Gold : Catamaran Surfing, Madras. "The Houses of Kraimokou, circa 1819." Finney and Houston (1996) Page 37..
1819. Arago : The Houses of Kraimokou. "The Houses of Kraimokou, Prime Minister of the King, circa 1819." A wonderfully detailed ilustration of Hawaiian dwellings, with the chief in ceremonial dress and his wife beating tapa cloth. Like all the other early images, she is bare breasted. The buildings closely resemble a house initally drawn by John Webber in 1779 titled "An Offering before Capt Cook in the Sandwich Ilses". An engraving, based on the drawing by S. Middleman and J. Hall, was included in Cook's published journals in 1884. Beaglehole (1974) Plate 41, between pages 672 and 673. "The collection of drawings which Captain Freycinet has brought home from his voyage round the world . . . affords the strongest proof of the unwearied zeal and remarkable intelligence of M. Arago, the draftsman to the expedition" - from the introduction to Arago ? by Forbes. (p. xxvi). Borba de Moraes I, p. 44. Brunet I, 372. Ferguson 885. Forbes I, 562. NMMC I, 154. Sabin 1865. BT000064. Volume 2, Part 2, Book 4, Chapter XXVII, Pages 517 to 622 (?). Dela Vega (ed, 2004) page 20. Cited by Finney and Houston (1996) Page 38. Scanned from Finney and Houston (1996) Page 37. Finney and Houston (1966) Plate 12. Finney and Houston (1996) Page 37. Margan and Finney (1971) Page 19 Dela Vega (ed, 2004) page 20. Nat's History (1983) Page 33 (badly cropped) Lueras (1984) Page 35. Colourised, see below. Kampion : Stoked (1997) Page 31 : "Kraimoku Homestead" by Villroy. Bishop Museum. Mr. and Mrs. Severson Collection. The sheen on the left hand side is a scanner imperfection. Finney and Houston (1996) Page 38. 1819. Arago : Wahine, Hawaii. Jacques Arago (Engraving : ?) : "Wahine, Hawaii, circa 1819." An account of a tour around the world, circa 1820. The University of Adelaide Library Electronic Texts Collection. Scanned from Finney and Houston (1996) Page 38. Finney and Houston (1966) Page 43, Figure 5. Margan and Finney (1971) Page 19. Taylor, Rev. Isaac: The Ship. Tarry-at-Home Travellers and the Scenes of series. Introduction to various branches of useful knowledge." It was published in a number of editions in the 1830s, and subsequently reprinted several times before 1854.
sons; Charles, Richard, and William. engraving of a double canoe, probably etched by Taylor, and based on an earlier work. British mariners, most notably James Cook. and the shoreline in the background, somewhat reminiscent of Hokusai's famous woodblock print, Under the wave off Kanagawa c.1830. Importantly, the board is placed on the wave face, unlike many subsequent illustrations that show the rider on the back of the wave. It precedes, by the slightest of margins, the widely reproduced Sandwich Island Surf-riders, attributed to F. Howard and first published in Rev. 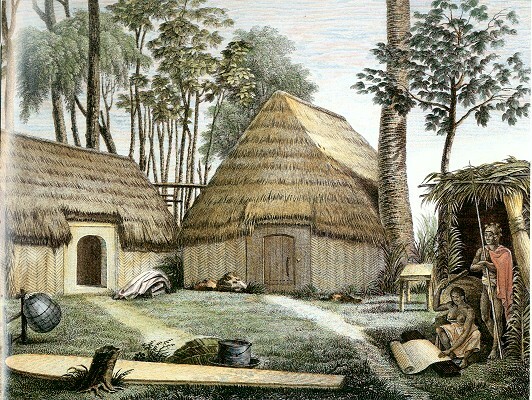 William Ellis' Polynesian Researches in 1831, see below. 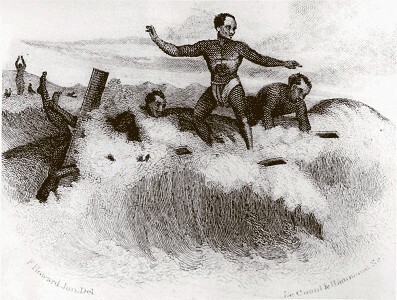 1830 Issac Taylor : Surf Riding in Hawaii. 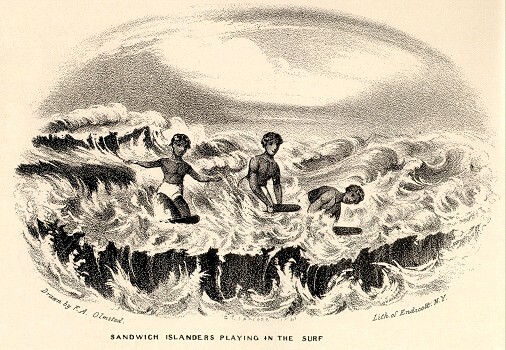 "Sandwich Island Surf-riders, circa 1830." 1830. Howard : Sandwich Island Surf-riders. F. Howard : "Sandwich Island Surf-riders, circa 1830." First published ... Rev. William Ellis : Polynesian Researches, During a Residence of Nearly Eighty Years in the Society and Sandwich Islands, Volumes I to IV.. The "Sandwich Islands" was the name originally given to the Hawaiian Islands by Cook for a friend and patron, John Montague, the fourth Earl of Sandwich (as in the "invention" of a piece of meat between two slices of bread). Montague was the the current first Lord of the Admiralty.The description was used up to the late19th century. Scanned from Finney and Houston (1996) Frontpiece. Finney and Houston (1966) Frontpiece. A particually poor reproduction, unlike the other images in this book. Dela Vega (ed, 2004) Pages 18 -19. 1841. Omsted : Sandwich Islanders Playing in the Surf. First image by same writer and artist. Francis Olmsted (drawing) : "Sandwich Islanders Playing in the Surf, circa 1841." Lithograph by Endicott, New York. First image by the same writer and artist. Scanned from Lueras (1984) Page 39. Dela Vega (ed, 2004) page 24. 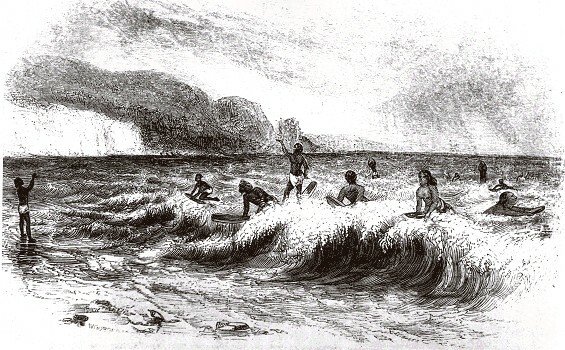 Hawaiian Sport of Surf Playing, circa 1851. DelaVega (ed, 2004) page 14. First Magazine article with surfing and art. 1851. Anonymous : Hawaiian Sport of Surf Playing. Woodblock or etching. The location is not specified. The image indicates surf-riding is a community activity and there are a variety of riding positions. The one cental standing rider is problematic - they appear to be riding out to sea. Some other riders are located much further from shore than the central figures, possibly indicating they were riding larger waves and probably having a signficantly longer ride. There are two standing 'riders' further from the beach, both with their hands held directly above their heads. 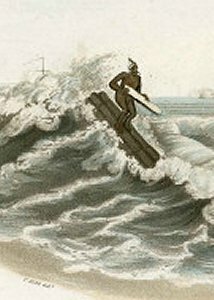 F. Howard's "Sandwich Island Surf-riders, circa 1830." "First Magazine article with surfing and art." - Dela Vega (ed, 2004) page 14. Cheever, Rev. Henry T. : Life in the Sandwich Islands, or the Heart of the Pacific, as it was and as it is. H.W.Derby, Cincinnati. 1851. Pages 66 to 69. Cheever, Rev. Henry T. : "The Sandwich Islands Today"
Volume IV, Number III, October 1851, pages 298 - 299. "This publication was short lived and was merged into Harper's Monthly in 1852." Finney (1959) Plate 1, between pages 330 - .331. 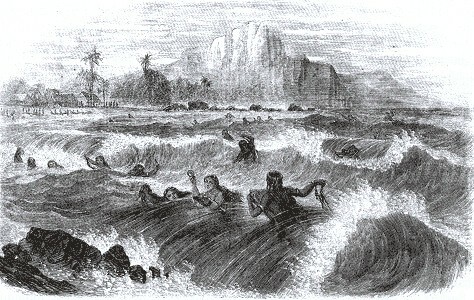 Hawaiian surfing scene, from Cheever 1851:68. The artist although ditinctly portraying the prone, kneeling and standing positions, has incorrectly pictured the surfers riding behind the wave. A surfer always slides on the forward slope of the wave. Finney and Houston (1966) Plate 9. 1866. Anonymous : Surf swimming at Hawai'i. Woodblock or etching. The image indicates surf-riding is a community activity. The rocky outcrop in the foreground is a potenial danger to the riders. The line up of three successive waves appears to indicate left-handers and a possible off-shore wind. "Surf swimming at Hawaii, Sandwich Islands." New York Arkell Weekly Co.
7 April 1866. Page 37. Includes a reprint of the previously published account by Rev. William Ellis, 1830. DelaVega (ed, 2004) Page 5.